Got your attention, didn’t I? Well, so did the name of the restaurant I visited last weekend, I mean, how can something called “Mulebone” not spark curiosity? Plesae know that I think it’s a horrible name for a restaurant, that’s my opinion. All told, I had a great time at Mulebone. My friend Rebecca joined me, and there’s nothing better than catching up with a friend and criticizing a restaurant at the same time. Actually, Rebecca has never said anything bad about anything or anyone for as long as I have known her. She does laugh at my comments, though, so mark her down for collusion. I take a sketchbook with me when I go to restaurants, and make pencil drawings of all the things I eat. Used to be I’d take a picture, but then everyone started taking pictures and the more upscale establishments (the ones I aspire to patronize) said that pictures weren’t allowed, so I started drawing. Not really “started” drawing, I do have an art degree. I never mention that when I’m drawing though, so as to protect the reputation of my alma mater. I don’t draw very well, you see. Entering the restaurant, I was overwhelmed by the multicolored things to look at. They have all sorts of vintage items hanging from the walls and tossed over antique coat racks. I was mostly taken by the candles placed all around the foyer and the reception desk – real candles that cast a warm and inviting glow all around the room. STOP. This post is beginning to sound woefully “Washingtonian.” A real Mulebone, if you know what I mean. I’ll jazz it up with by telling you about my chat with the hostess. “Do you have a reservation?” she asked. “Yes, I do,” I said. “Jennifer Moore. I know, I know, you’ve probably heard of me.” I say this all the time. It is one of my favorite hobbies, outside of making diners nervous by sitting alone in a restaurant and drawing my food. I have a penchant for throwing hostesses off balance by suggesting I am some sort of celebrity. It delights me to see their faces go blank, that kind of non-committal blank one gets when the fear of not knowing something one should know sets in. I enjoy watching the proverbial wheels in their head whirl as they try to place me, as they begin to think maybe they have seen me on TV or have heard my name on NPR. They stammer a bit, struggling with their conscience as they try to decide if they want to shame themselves by admitting they don’t know me, or lay out a bald-faced lie by saying they do. It’s just then that I laugh, swat at their shoulder with a playful hand, and say “I’m just kidding, I’m nobody.” Does it make me mean that I consider this fun? I don’t think so. I think it’s what makes me fun. It certainly sets a mood. You might want to try it. In my experience, it guarantees the best table in the house and fawning waiters who are all too eager to bring you extras, like a whole bowlful of limes for your tonic water and a heaping plate of butter for your bread. Delightful. Oh, that was the best part of the evening. The food sucked. The broccoli rabe was overcooked and tough, the shrimp on the grits was tough, and the smoked vanilla ice cream was tough to choke down. “Mulebone?” I should say so. Thank goodness for those free corn muffins. Tear down this wall! Let’s build this wall! If you recognize those words as having been spoken by a turncoat Lindsey Bluth in shorn hair and a business causal suit, then I am happy and sad for you. Happy because you discovered the snarky genius that is Arrested Development; sad because you watched the fourth season. You watched all the way through to the last episode of a season that should have never happened. Walls. Walls are good. Walls keep the A/C in and the mosquitoes out. Walls define where the TV should go versus where the stove should go. Walls keep us from having to see what our neighbors look like first thing in the morning. That’s the physical walls, the ones made of brick and sticks and stones. But it’s the emotional walls that do the real work. How can something invisible be so impenetrable? Here’s my lunch from yesterday. 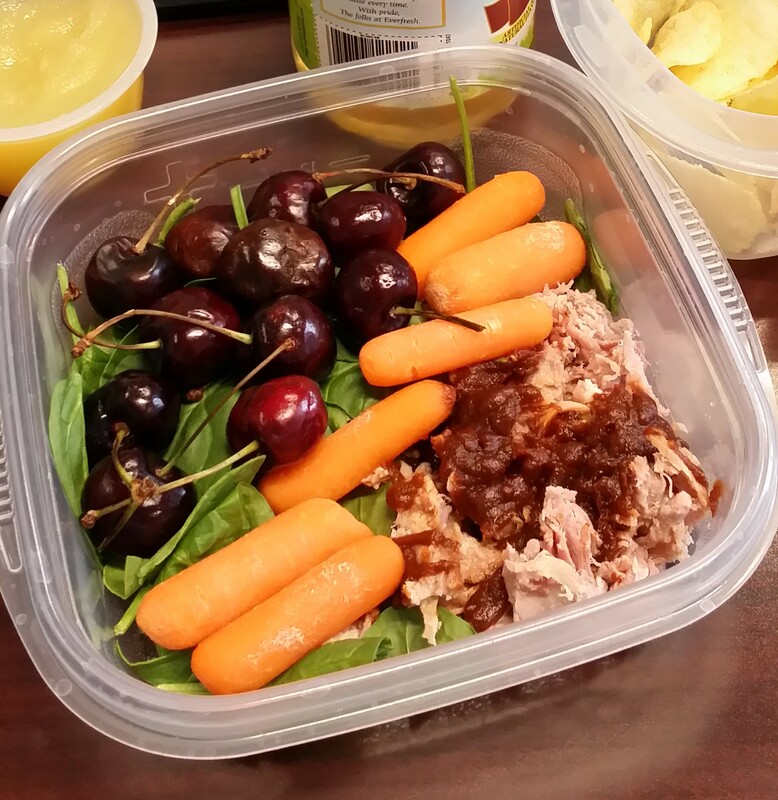 Please admire how the baby carrots form a wall that keeps the BBQ sauce from getting on the cherries. This is an important wall if you don’t like BBQ sauce on your cherries. But what if you’ve never had BBQ sauce on your cherries? What if, in a fit of contempt prior to investigation, you’ve dismissed BBQ sauce on your cherries as something that will taste bad and might even hurt you? “Might even hurt you.” We’ve clearly moved beyond physical walls and into the more interesting world of emotional walls. I have emotional walls, as pointed out by every man who has ever dated me and doesn’t date me anymore. They haven’t told me anything I didn’t already know, I put up the walls intentionally. They have purpose. Emotional walls keep me from getting too chatty with the cute guy in my yoga class (he could be an axe murderer, etc., etc.) Emotional walls keep me from confiding too much in my friends (they could turn on me at any time.) The walls keep me safe. The walls ensure that I won’t get all vulnerable and end up hurt. Hurt, you know, like how you can choke on a BBQ sauce covered cherry. I’ve experimented with lowering my walls. They’ve gone from gargoyle-festooned castle walls to chain link fences to curbs. Not the curved, bicycle-friendly curbs, mind you. They’re the old-fashioned hard right-angle curbs that can stub your toe. A stubbed toe incites a unique pain, the type of pain that can make you want to dissolve and ooze back over the curb and right down the gutter to the nearest “Chesapeake Bay Sewage” drain. I don’t want to get drained. Too risky. Let’s do it, Lindsey, let’s build that wall. 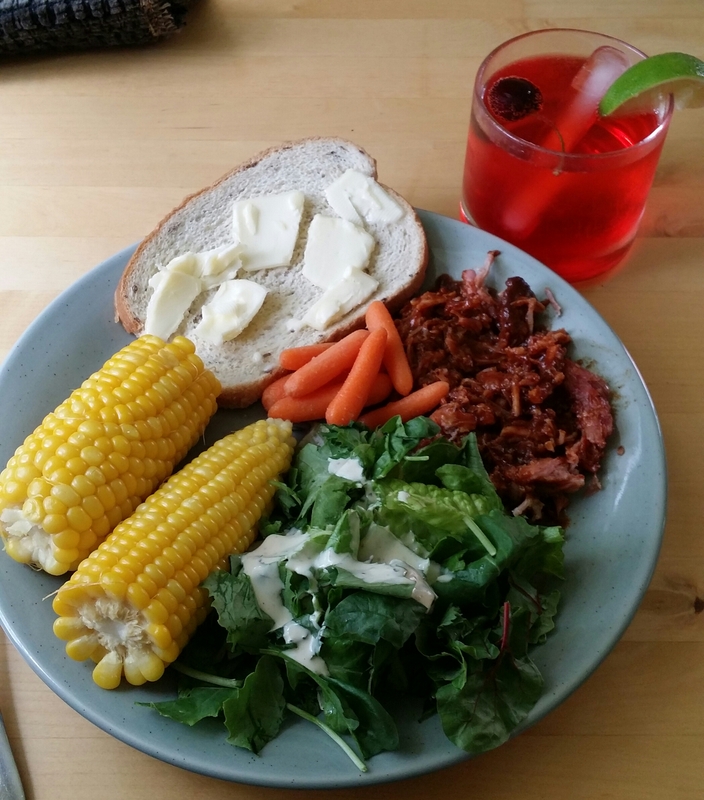 Four hundred and fifty thousand Americans are blogging right now about their 4th of July gastronomic adventures. You can only read so much about burgers, wings, and beer. So, to maintain your interest, I have included a fun tip, a lesson of the culinary kind. My 4th celebration was at home. With my cat. At 2pm. I had no grill to scrub, no drunks to kick out, and the whole afternoon and evening was left open to nap. But that’s not the lesson. BBQ, store-bought in a tub with the addition of bottled sauce. “Addition” sounds like a lesson, but that’s not it. Mixed greens and kale with Caesar dressing. Baby carrots. Sweet corn boiled up with salt and sugar added to the water – that could be a lesson but everyone knows that’s the only way to boil up corn. Now you’re seeing it. The buttered bread. Who has buttered bread on the 4th of July? Only those who have learned the lesson, my friends. Only those who have learned the lesson. Growing up, how to eat corn was a challenge that plagued my family every summer. Of course the “holders”, plastic miniature corn cobs with dual spears, were mandatory for getting a grip on the thing. Butter and black pepper were indicated. Nay, required. You can put as much salt and sugar as you like in the boiling water, but sweet corn ain’t no good iffin’ it ain’t got no butter and black pepper. The conundrum: how do you make the butter stick? In magazine photos there is always a geometrically perfect pat of butter perched atop the ear. Good thing they snapped that shot when they did, ’cause two seconds later that pat of butter oozed its way off the corn and onto the plate, un-scoopable and worthless. My family did try that ‘roll the ear right on the stick of butter’ fad, but once my mother saw all the wayward corn silk stuck to the butter plate she put the kabash on that right away. The lesson, the tip, is in the slice of bread. My mother is from Jersey, my father is from Alabama, so it’s not a Northern nor a Southern thing, but when I lived in a double-wide out in Southern Illinois I was introduced to the glory that is the butter-to-bread-to-corn application system. Must be a Midwestern thing. Not difficult in preparation or execution, the diner simply smears butter on bread, holds bread on palm of hand, slaps the corn cob in the middle of the bread, squeezes hand around bread and uses other hand to twist cob around and around. Laws of physics ensue and the butter gets on the corn. The corn gets buttered. Even those little spaces between the kernels get jam-packed with butter. The process is inspired. Transcendent. The result: delicious. Now, that’s your lesson. Your fun tip. Perhaps you have learned something today. Perhaps you’ve been reminded of something you forgot. Perhaps you already knew this, have been doing it for years, did it this very day, this very 4th of July and you’re thinking I’m pretty lame for making you read this whole post. Nope. I’m just glad you read it. There’s a lesson in that, too. I winked at someone last night. It was harmless. Nothing will come of it, except, you know, the obvious. The trap. Going to Staples at 9:30pm on a Wednesday is hardly what I would call a good time, but there I was, selecting binders and 3-hole paper for a project that was just assigned to me – due the next morning after having had languished on my boss’ desk for weeks. I needed CDs, too. I hate shopping for any kind of technology, the choices are overwhelming, and my ignorance, mired in a lack of interest, leaves me wide-eyed and slack-jawed in the aisles. He came to my assistance unbidden. When I feel like a moron I typically like to be left alone but there he was, a diminutive man asking me if I needed read/write or read only and then nodding professionally as he handed me a stack of CDs. My problem was solved, my angst alleviated, and then he was gone. “That’s Rubin,” she said. “Wait, was he wearing a shirt like mine?” she tugged on the hem of her red shirt. “Yes, he was,” I said. “He’s not a tall man… I’m going to send a note to the manager, to tell him how helpful Rubin was,” I said, as I grinned and winked. That’s how it happened. That was the wink. And now I have to live with the consequences of that wink, the certainty that I’ve set into play a stream of winks that will plague me until it’s replaced by some other involuntary twitch – maybe the horrendous thumbs-up or the damning finger gun with the corner of the mouth ‘chitk-chitk’. The good habit of thanking people for commendable service has let loose the bad habit of asinine gestures and verbal emissions. It’s not fair that it took years to develop the good habit and mere moments to unleash the bad. Moreover, it’s not fair to the Rubins of the world. I simply can’t afford to be trapped like this. It’s just not worth it to be appreciative.